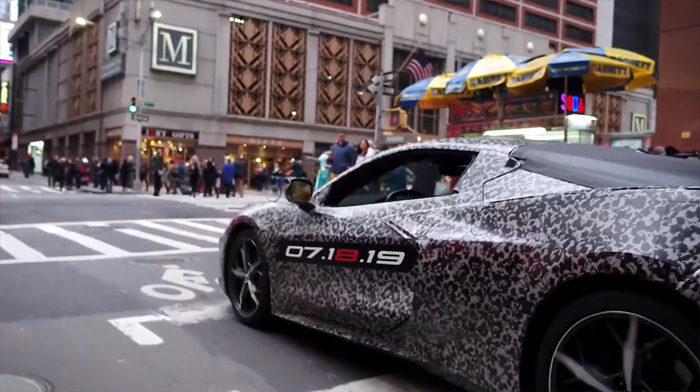 Here’s another look at the 2020 Corvette’s fun trip through Manhatten late Thursday afternoon as Corvette Chief Engineer Tadge Juechter drives General Motors CEO Mary Barra to the Stephen Siller Tunnel to Towers Foundation gala. As you can see this was no joyride but a carefully coordinated drive through some very crowded streets! Chevrolet announced the next generation Corvette will be revealed on 07.18.19 at a yet undisclosed location. That is a well done publicity stunt! A great stunt for a no-doubt great car. I’m excited. Just returned from Barrett-Jackson auction in West Palm Beach, Florida. Spoke to factory rep about C8 Corvette. He confirmed the revealing of the C8 will be July 18th, 2019 at a location not disclosed at current time.